You are here: Home / News / Mini-projectors in iPhones and iPads? 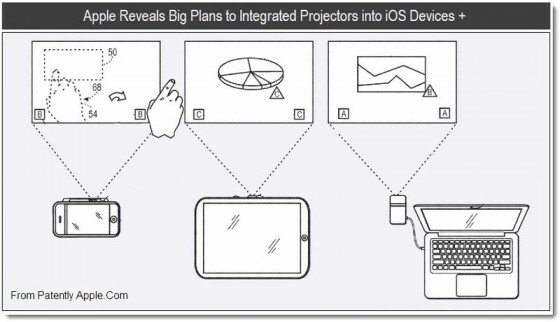 In a recent patent application, Apple may be revealing their intention to integrate mini-projectors into their iOS devices (iPhones and iPads) as well as a possible portable video projector accessory for Macbooks. Recently, we posted an article about developments in lens technology that is an important step towards integrating a video projector into smartphones and portable devices. Now, with this patent by Apple perhaps the days of embedded mini video projectors is closer than we may think. Also of note in the patent application is language describing “gesturing analysis” that might permit a novel user interface. In this scenario a user could interact with the projected image – shadows created by a user’s gestures, whether onto a video projection screen or wall, would be interpreted by image processing software. Apple, in previous patents, has shown interest in projection technology, but this patent is the most comprehensive to date and suggests that it has become a priority for Apple engineers.